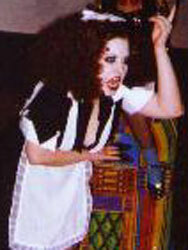 Traci Hunnewell first started going to Rocky Horror in the fall of 1992. She went with a few of her friends who had gone to the Full Body Cast's show in Harvard Square and had loved it. Not even half way through the show as she sat and watched Columbia tap dance across the stage, Traci was hooked. "One day I'll be up on that stage performing Columbia with this cast," she swore as they were leaving the theatre after the show. Her friends laughed at her, saying yeah right, whatever. But lo and behold, 4 years later (after a brief tour in the US Army's MP Corps) she was on that stage, tap dancing her heart out across the stage and loving every second of it! Traci started with The Full Body cast as Columbia, but now performs Magenta. She enjoys performing with her fiancé Eric Carter who plays Riff, whom she met at the show. She is also the Cast Choreographer and the pre-show coordinator as well as the cast costumer, and just recently became Co-Director of the cast. She also has just started up her own costume business called Red Rose Designs (www.crimsonvision.net). She has won many awards for her costumes, both Rocky related and not. 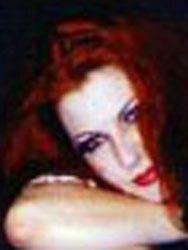 Just recently she was voted best screen accurate Magenta at the Allentown East Coast Con 2000. Traci is heavily involved in planning the EC 2001 convention right now as well as planning for her October 2000 wedding! Why does she do it you ask? "I believe you get out of things exactly what you put into them. I have gotten so much out of joining Rocky: my fiancé, my friends, my business. I guess I am just trying to play catch up now!"